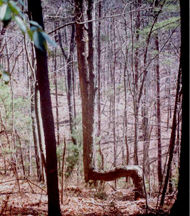 this morning i found a very unique article about an interesting tree phenomenon in which a significant number of trees scattered throughout one region of the country bend 90 degrees not far off the ground, and run horizontal only to bend 90 degrees again and continue in a traditional upward pattern of growth (as seen in the picture above). this most bizarre tree growth is, as one could guess, not natural. in fact, it has recently been hypothesized that these trees were systematically altered by indigenous peoples as a sort of architectural marker or way finder to designate a trail. when plotted on a map a number of these trees form a path that actually mirrors the appalachian trail. in fact, the trail tree blog documents much of this work. as the theory goes, native americans would cut off the primary trunk/branch just above the first secondary branch of a young sapling tree. 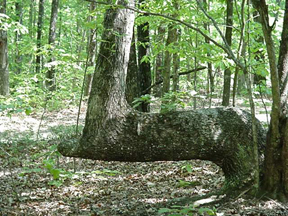 this would essentially force the tree to grow sideways for a period of time thus establishing their trail marker. what strikes me here is two-fold. first, this is what amounts to bonsai training but in large life-sized trees. in my eyes it’s an incredible eastern culture/western culture parallel in which both societies practiced essentially the same rituals but for entirely different reasons with very similar effects. second, i’m amazed by the use of trees as architectural markers. i guess one could argue the beginnings of architectural organicism here. additionally, these trees are wonderful objects to behold. their unique geometries and forms seem to defy nature and the large scale/old growth aspect of each tree only makes the situation that much more impressive. I used to believe the same thing . . . only for trail marking. Some go much deeper than that. Prayer Trees, culturally modified trees, and more.